Manufactured from one of the leading brands in childcare, these Pampers Baby Dry Jumbo Size 6 Giant has a unique way of capturing and locking away liquids. The revolutionary technology uses 3 absorbing channels to distribute wetness evenly with an inner layer of Micropearls to keep wetness at bay for up to 12 hours. The Fast Dry Layers keep moisture away from the baby's skin with flexible sides included to contour around their legs and prevent overnight leakage. Finally, the material used has been noted for its breathability, ensuring the air can circulate around the babies skin and helping to reduce issues including nappy rash. 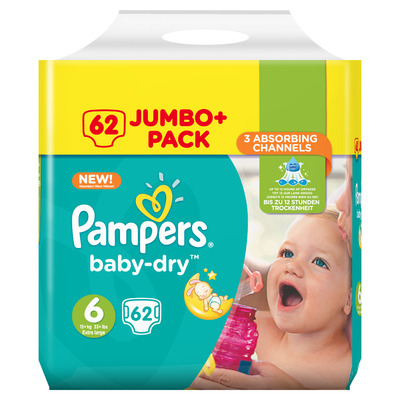 This large 86 pack of Pampers nappies is ideal for busy nurseries or simply as a replenishment stock for your home. Here at Gompels, we have a wide range of nappy options from Pampers through to our own brand options and all for exceptional wholesale prices.